One of my favorite things when Spring rolls around is asparagus. This is a glorious time to live when we can get spring-like fresh asparagus nearly year round in the local mega mart! I admit I indulge in this dish whenever I can. It’s not that it is much of an indulgence really, it just seems that way since it’s so creamy and luxurious on the tongue. 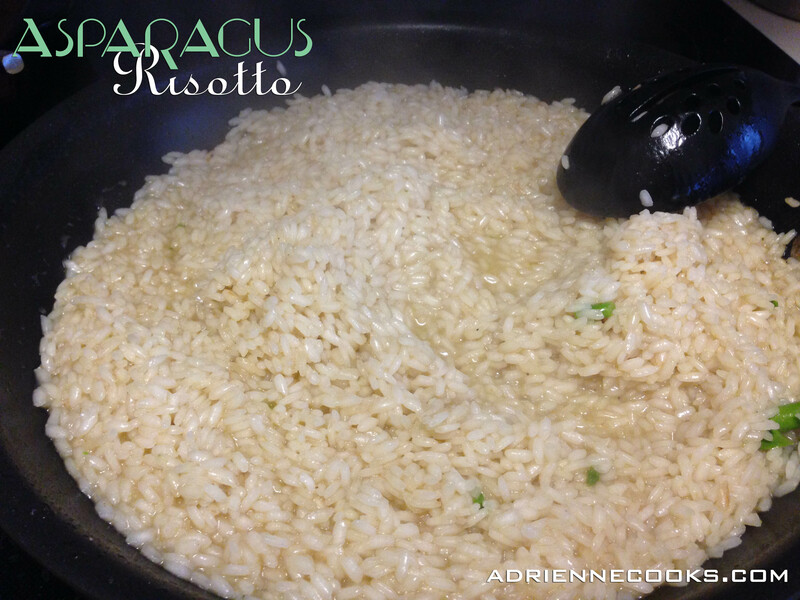 Give this or any risotto a try and you’ll instantly see what I mean. You can easily leave out the wine too, if you like. I do, not because I don’t like the taste it’s just that I don’t want to schlep to the store to buy wine I don’t drink and then only use a half cup! Seems like a waste to me. This is labor intensive. Not hard, not at all. Just “busy work”. You will STIR and stir and stir. It’s SO worth it. 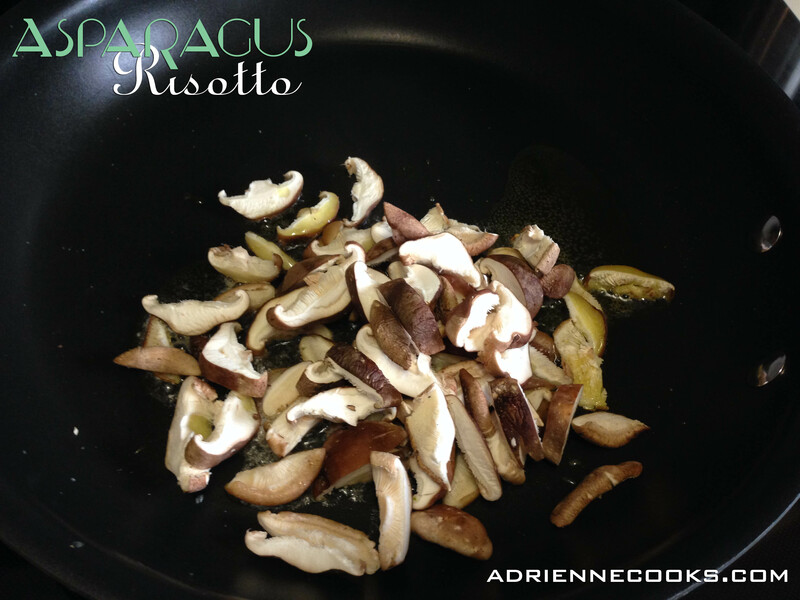 Sauté your mushroom slices in a bit of butter, let them release their liquid and shrink in size. Then add your sliced mushrooms and asparagus to the 6 cups of chicken broth. You can easily make this vegetarian by using vegetable broth! Bring broth to a simmer and leave it alone. You’ll need it in about 5 minutes. Melt butter in a LARGE skillet over medium heat. Sauté onion and garlic until onion is clear and garlic is fragrant. Watch the heat and don’t scorch the garlic. If it’s turning brown through it out and start over – burnt garlic is bitter. 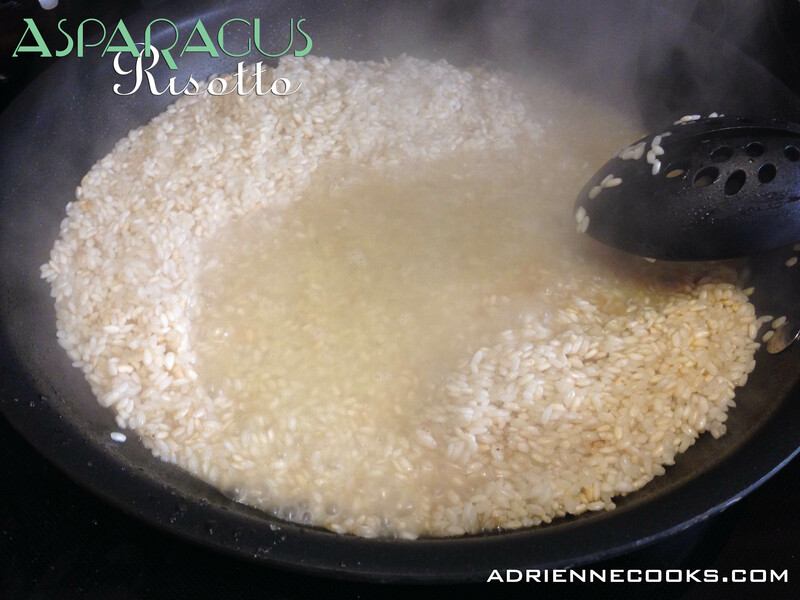 Add your rice and stir it around to coat it in the butter – don’t let it stick but move it around for 1-2 minutes. Increase heat it medium high and add wine or ½ cup of broth to deglaze the pan and further cook the onions. 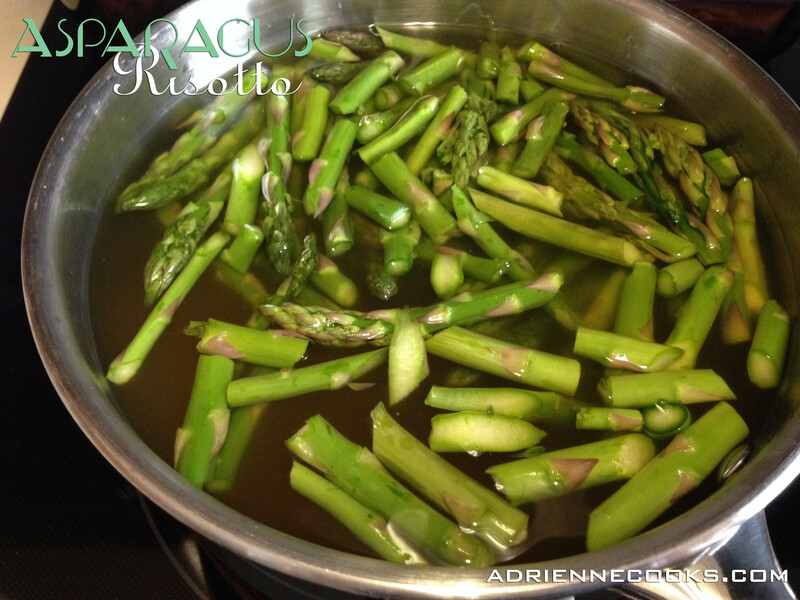 Let the wine/broth reduce/absorb till nearly gone – about 3 minutes. 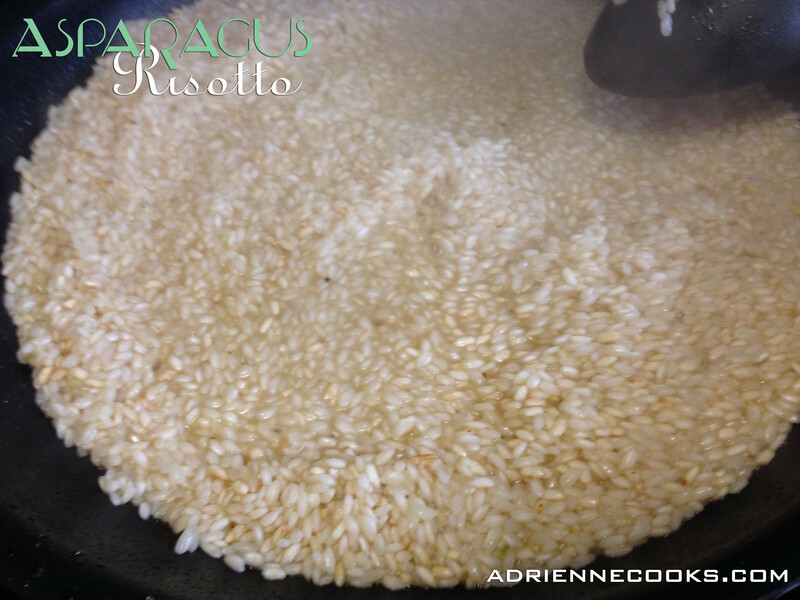 Add 1 cup of chicken broth, stirring constantly until most of the liquid is absorbed by the rice. Tip: when you drag the spoon through the rice on the bottom of the pan it should slowly star oozing back, but no liquid should rush in. Repeat! Seriously. Ladle out broth 1 cup at a time into the rice. Let absorb while stirring. Do it again. And again. I know you may want to skip this step, but that’s what makes it creamy. You’ve been warned! 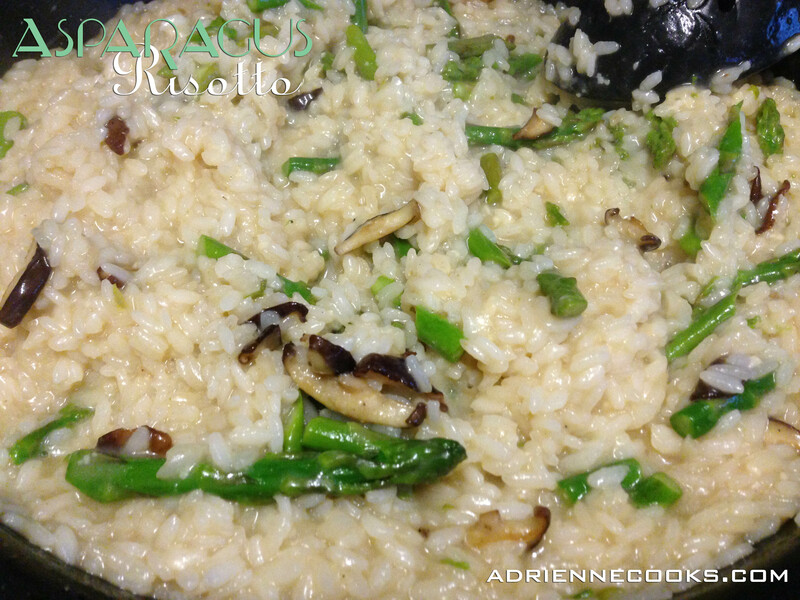 When you’ve sufficiently broth-ed your rice (when the broth is gone and the rice is thickened and creamy (taste a bit to make sure it’s not crunchy – if it is you need more broth)) you can add your asparagus and mushrooms. Toss in the Parmesan, salt and pepper to taste and stir. Serve with additional Parmesan if desired. Now chow down!